Amidst the crackle of cellular signaling, it can be hard to distinguish between cells that are quick on the draw, and those that take a long time “drawing a bead” before they finally fire. When the smoke clears, it may be too late to identify which cells have itchy trigger fingers. Such cells may overreact to hormones, instigating ill-fated chemical responses that culminate in cancer. To detect rapid-fire cell signals, biomedical engineers at the University of Toronto have invented a new device that more quickly and accurately “listens in” on the chemical gunplay between (and within) cells. The device makes use of a technique the engineers call digital microfluidic immunocytochemistry in single cells (DISC). DISC harnesses the power of digital microfluidics by shuttling tiny drops of water around on an array of small electrodes that looks more like a miniature checkerboard than the O.K. Corral. The miniature checkerboard’s advantage is that it increases, by a factor of 100, the speed at which chemical changes can be detected. 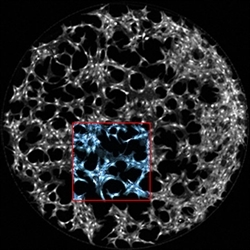 The new technique was described in an article that appeared June 24 in Nature Communications. The article—“Digital microfluidic immunocytochemistry in single cells”—explained that by using the right sequence of voltages, the U of T researchers were able to create electric fields that attracted and moved around droplets containing various chemical solutions. In addition, the researchers showed how they were able to deliver a quick-fire sequence of chemicals to small groups of cells stuck to the surface of the board. For example, the first drop might contain a hormone that tells cells to grow faster. Within seconds, this hormone sets off a chain reaction called a “phosphorylation cascade,” modifying certain proteins within the cell in a specific sequence. To see these changes, scientists deliver a second drop containing formaldehyde, which freezes the all the proteins in place. They then deliver a third drop containing fluorescent antibodies that stick only to the proteins modified in the cascade. Looking at the antibodies in a microscope provides a snapshot of what has changed and what hasn’t. “DISC [can enable] the interrogation of protein phosphorylation on pulsing with stimulus for as little as 3 seconds,” the authors asserted. For example, the U of T team made some interesting discoveries when they tested the technique on a type of breast cancer cells. “Roughly 10% of the cells had a very rapid and strong response that we could detect up to five minutes before the rest of the population,” said study co-author Dean Chamberlain, Ph.D. The team speculates that these “rapid responders” may be involved in the early stages of tumor generation. While scientists have long suspected that some cancer cells respond to signals faster and more strongly than others, the new device offers a way to study such cells in unprecedented detail. “With the ability to probe these reactions with the same speed at which they occur, we’re better equipped to figure out the internal wiring of the cell,” noted first author Alphonsus Ng, Ph.D. The team hopes to discover new cell types or proteins that could be targeted by drugs, eventually leading to new medicines to fight cancer.